Today was a rainy and cool day that kept us from playing outside during the day. There is something about rainy days that makes me want to bake but I wanted to bake something for my kids that was not just chocolate and white flour ingredients. 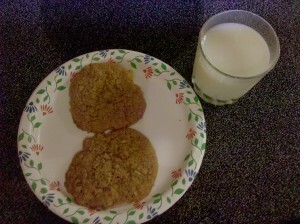 I decided to try to bake a recipe for Oatmeal Raisin cookies with whole wheat flour, rolled oats and raisins. If you have ever stopped at Great Harvest Bread Company and tried one of their cookies you know how good they are and you don’t feel totally guilty because they are made with natural ingredients and whole grains. I searched and found an adapted recipe for Great Harvest Bread Companies Chocolate Chip cookies that I edited to make Oatmeal Raisin cookies. Combine Brown Sugar, Molasses, Vanilla, Eggs, Milk in a stand mixer. Add Raisins and mix until well blended. Bake at 350 for 12-13 minutes or until the edges start to turn golden brown. Cool on cookie sheet for 5 minutes, remove and finish cooling on cooling rack. Makes 4 dozen normal sized cookies or if you want giant cookies, use a 1/4 cup measuring cup to measure 24 giant cookies. One of my favorite grilling recipes for the summer is Grilled Bruschetta Chicken. I have tried many variations of this recipe and this is my take on the recipe. 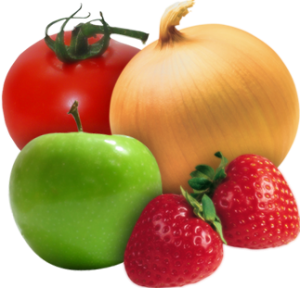 4 Tinfoil bowls, take sheets of tinfoil and roll in the edges to make a bowl so juices don’t run out. Clean and trim the fat from the chicken breasts. Marinate chicken breasts in the Italian dressing for a minimum of two hours. Preheat grill to about 300 degrees. Sprinkle the chicken breasts with the seasoned salt and pepper and place them on a preheated grill. Grill the chicken breasts until no longer pink and the pretty grilled marks always look good! Place one grilled chicken breast in the center of each foil bowl back on the grill. 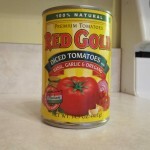 Mix the Olive oil into the Diced Tomatoes. Spoon on 1/4 of the Diced Tomato mixture over each chicken breast. Sprinkle 1/4 of both the mozzarella and parmesan cheeses over the Chicken breasts and Diced Tomatoes inside of each foil bowl. Close the lid of the grill and allow cheeses to melt and the diced tomatoes cook with the chicken breasts. I like to let my cheese start to start to get golden brown where it touches the foil. 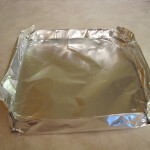 Carefully pick up the tinfoil bowls with hot pads, and slide the contents of the foil bowl onto four separate plates. The chicken is so tender you can cut it with a fork! Grab a bit of cheese and tomato with each bite. I like to serve mine with a dinner salad and some toasted garlic bread! Enjoy! I was a vegetarian for 10 years and I never had the desire to eat meat until I smelt my mother in laws homemade chicken noodle soup simmering on the stove. 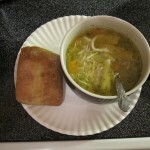 I am now a huge fan of chicken noodle soup, it is the meal I make and bring to my friends who have babies, it is the meal I make for gatherings at my house in the winter. It is the perfect comfort food. I tried about 10 different recipes and took what I liked from each to make this recipe. This is what I consider the Perfect Chicken Noodle Soup. 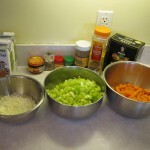 Boil the chicken thighs or whole chicken in a large stockpot in the 2 containers of broth add 1/2 of the carrots, 1/2 of the onion, 1/2 of the celery and leaves and the tsp of garlic. Boil for 1 hour or until the meat is easily shredded. I pull the thighs out and shred them on a plate and dump them back in. Add bouillon cubes, 4 cups of water, and the rest of the ingredients and seasonings to the stockpot bring to a low rolling boil and add homemade noodles, boil 30 more minutes or until noodles are tender and serve! Even my kids love this recipe and will eat all of the veggies and chicken. On a clean, flat surface, place 1 cup of flour, create a hole in the center of the flour pile, add the salt, and crack the egg inside the hole. 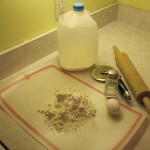 Then fill up one half of the egg shell with milk two times and place the milk in the hole of the flour as well. 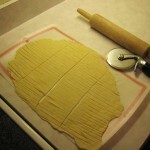 Gently fold the ingredients together by hand until it is a soft doughlike mixture. If you need more liquid, slowly add 1/2 eggshell of milk at a time until it is a sticky ball. Sprinkle a little flour on the flat surface and Roll out the dough with a rolling pin until it is as flat as you can make it, it needs to be thinner than a pie crust. Once it is as thin as you can make it, (once you boil it, it will plump up) cut skinny strips of noodle about 1/3 inch wide with a pizza cutter. 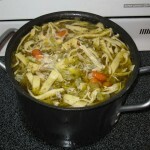 Add homemade noodles one or a few at a time to the chicken soup at a low rolling boil so they don’t stick together. Boil in the soup until they are tender, or about 30 minutes.